We wish you all a happy, healthy and safe New Year! 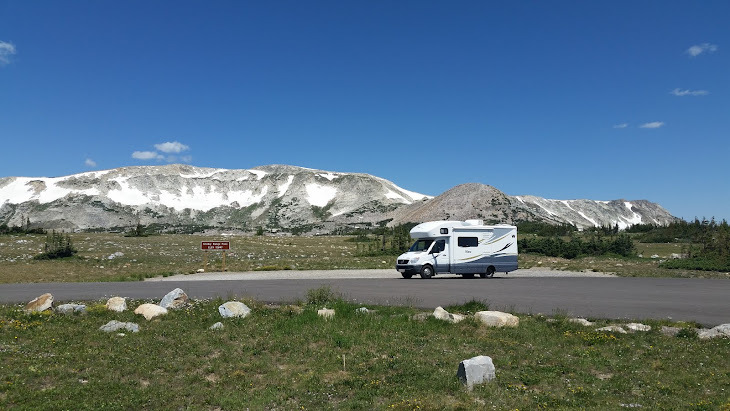 As we look back on 2009, we are grateful that we have been able to travel from the shores of the Atlantic Ocean to the heights of the Rocky Mountains to the northern shores of the Great Lakes and many places in between enjoying the fulltime RV lifestyle. The best part has been the ability to visit with family and friends including new acquaintances along the way. We are closing out this year with our daughter Heather and husband Ryan in Florida. We are enjoying some traditional Dutch New Years fare in the form of “olliebollen” and some not so traditional entertainment. How some things have changed. We wish you a happy and safe Christmas! We are again fortunate to be able to spend Christmas with our daughter Heather and her husband Ryan in the relative warmth of North Florida. We have a very nice campground just a few miles from their home right on the water. Katie is unable to be here with us this year, which is a bit sad but part of the changes in life over time. In fact she has been traveling for the Air Force fighting weather in the northeast for a visit to the Naval Academy and then yesterday had to return to Colorado Springs in the face of another huge storm dumping over a foot of snow in the foothills of the Rockies. We are glad she made it back home for the holiday safely. We are busy with the usual cooking preparations and looking forward to a calm but fun holiday. A week at Mayport Naval Station is coming to a close. It has been a week of generally poor weather with heavy rain and high winds. In fact there were only two days where you could comfortable sit outside. We did manage to get together for a chat with John Schrinner, who served with me in Philadelphia and recently moved to the area. It was good to visit after so many years. The campground sits right on the St Johns River as it reaches the ocean. This is an ideal location for ship watching, as they enter or depart the port. Due to the weather, sometimes we had to observe the traffic thru a wet front window. The beach fronting on the Atlantic is just a short walk away and we did get in some walks on the beach. After the heavy winds there was plenty of surf breaking on the channel boundary rocks. In addition to the ship traffic, there was the pass in review by groups of dolphins, which were very entertaining but hard to catch with the camera. Being a military base we were also entertained by the training sessions, some of which were accomplished almost behind the motorhome. We plan on returning again, hopefully with better weather. The last place visited in the Golden Isles was Jekyll Island. This island has a somewhat different history than the others we have visited. While it was first settled by an officer under General Oglethorpe of Fort Federica fame, it is best known as the location of the Jekyll Island Club for the early rich and famous. In 1896 the entire island was purchase by a group of wealthy northern business men. The original group of 53 included J. P. Morgan, William Vanderbilt, Rockefeller, Goodyear, and Pulitzer. They wanted an exclusive place to relax, hunt and socialize with those of equal status. They built the Jekyll Island Club house and later an annex when some of the members wanted even more privacy. Additionally, many of the members also built “cottages” on plots allotted to them. This lifestyle continued until the outbreak of WWII, when the residents became concerned that they would be the target of kidnappers from German U-boats. After the war they never returned to the island and the club buildings began to deteriorate. The state of Georgia took over the Island and is shown as a State Park, but is operated by the Jekyll Island Authority. It is truly a unique state park. The Jekyll Club and many of the cottages have been restored and are operated as the Jekyll Island Resort. The state owns all the land, but has allowed private residents and other resort operators to build on the Island on a lease basis. The center village of the Jekyll has been designated as a museum and tours of the cottages are possible. Additionally, a number of the cottages serve as restaurants and lodging as part of the resort. It is a great place for a vacation or any special event. The Island still reflects some of its early history. The ruins of the Horton house have been preserved. This was the Home of Major Horton, who served with General Oglethorpe and settled on this island. His home and property was obtained by the Frenchman Poulain Du Bignon in 1791. He died on the island and is buried near the creek across from the house. His family owned the property until it was sold to the millionaires to form their club. The area surrounding Brunswick is known as the Golden Isles, and includes the Islands of St Simons and Jekyll. St Simons is currently a residential area and tourist destination. We found it less crowded and for our kind of activities and more user friendly place than Hilton Head Island. Like most of the coastal places we have visited on this trip, it has a long history. It is home to the Fort Frederica National Monument which preserves the site of the Fort and walled town of Frederica that at its peak had over 800 residents. While the town and fort lasted only a short time, it played a major role in history. The short version of which was that the Island and Fort was in the disputed zone between English and Spanish territory. The Spanish invaded the island to drive out the English and confirm their claim on the land. After a brief and rather poorly planned engagement, the Spanish left in defeat and ultimately abandoned all claims to land north of the current state of Florida. While not much remains of the fort or town, the National Park Service has done an excellent job of providing an insight into the life of the fort and town. There is an Island history museum in a restored Coast Guard Station that was one of 45 identical stations built across the country under the WPA program in the 1930’s. The museum provides an excellent idea of life was like at the station thru the eyes of Ollie, a newly arrived recruit in 1941. In addition the museum has displays on local history and environmental issues. Flat Stanley enjoyed it as well, and helped us pick out a gift for our grandson. Well worth the visit. The modern Island is a place to live or enjoy as a tourist. There is a small downtown shopping and dining area with marina at the end of the street. All has that small town charm.